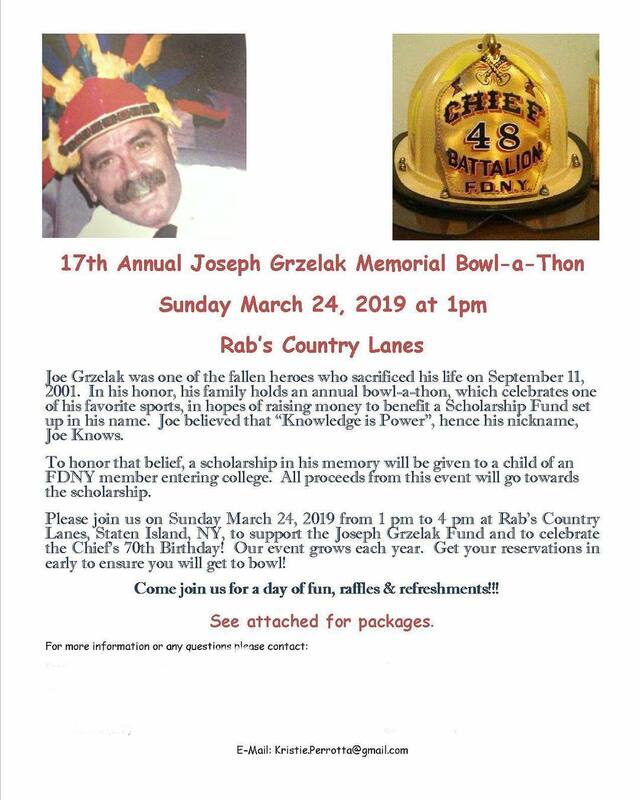 The family of FDNY Battalion Chief Joseph Grzelak will host the 17th annual Joe Grzelak Memorial Bowl-a-thon on Sunday, March 24, 2019 from 1:00pm until 4:00pm at Rab’s Country Lanes on Staten Island. Funds raised from this fun event will help the Joseph Grzelak Memorial Scholarship Fund in their work of providing scholarships for local students. This year’s event will be special, as it would have been the Chief’s 70th birthday. For details, please click here or email Joeknows279@gmail.com. Joseph Grzelak was called “Joe Knows” because of his encyclopedic knowledge of firefighting and just about anything else. He was killed leading his FDNY battalion at the World Trade Center while responding to the terrorist attacks of 9/11.